Safari to Tanzania in the heart of African savannah to discover the incredible wildlife. Photos of safari trip in Tanzania. HOW TO ORGANIZE A TOUR TO TANZANIA? This route between parks and protected areas in the north of Tanzania has the main objective of tracking the wildlife that inhabit the savannah in Africa, observing the animals in the nature and in their daily life, through a two weeks long safari. The nights, always spent in mid-level facilities and the comfortable 4x4 jeep for the exclusive use for own group, make the trip relatively "easy" and suitable also for families with children, provided they are used to travel in remote areas and have a normal ability to adapt. There are many travel agencies and tour operators offering travel packages to Tanzania which include flights, excursions, transfers and accommodations, for which you can choose the categories and the options accordingly to your preferences and budget. What makes the most difference in price is essentially if you want a completely private tour (so, with the car at your exclusive use and not shared with other travelers) or if you are willing to join a group in order to spread the fixed costs over a larger number of participants. Obviously, also the type of accommodation plays an important role on final price, since they range from cheaper mobile tented camps, to fixed camps, up to real resorts of average or luxury category. Generally, the travel package is customizable, especially if you choose a completely private tour, and your travel agent can provide more details about this. HOW TO GET TO TANZANIA? For the convenient schedule of the flights and the short distance from the parks of northern Tanzania, we chose Kilimanjaro airport (JRO) as the point of arrival and departure, flying with Ethiopian Airlines via Addis Ababa (connections from most countries of the world are easily available and usually not too expensive). 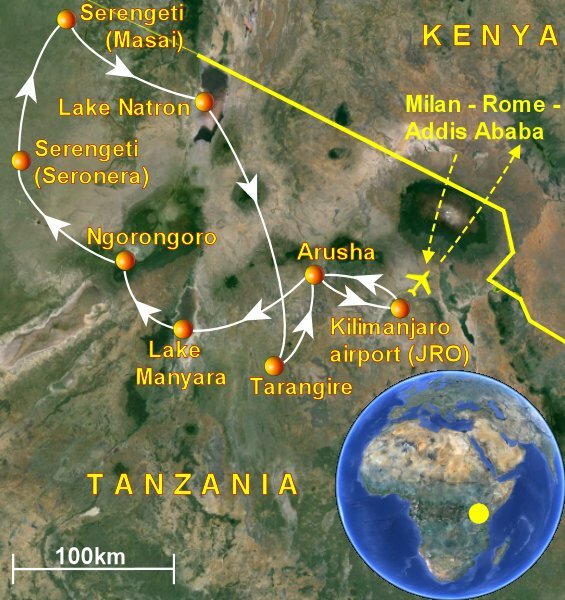 The route is then carried out from Arusha to Lake Manyara and Ngorongoro Crater, before reaching the Serengeti where the nights were distributed between two areas and optimized for the fauna's normal pattern during the period chosen to travel. Then, the trip in Tanzania continues straight to Lake Natron in the hope of watching the flamingos during the breeding season (but this year we were not so lucky: the destination is in any case very interesting for landscapes and contact with the local population). From Lake Natron we finally reach Tarangire National Park, before going back to Arusha for our outbound flight from Kilimanjaro airport. WHEN TO GO TO TANZANIA? When planning a safari in Africa and thus in Tanzania, you must know that every month of the year provides opportunities to observe different animals, different "actions" and different landscapes. Therefore, you should carefully study the seasons or take advice from experts to make sure the safari trip will suit your needs. Our safari tour to Tanzania was excellently organized by Rift Safari based in Arusha, which has customized the itinerary according to our interests and to the period that we have chosen to travel (second half of August). HOW MANY DAYS SHOULD I ALLOW FOR A SAFARI TO TANZANIA? MAY I DO A SAFARI AS AN EXTENSION FROM ZANZIBAR ? This essentially depends on your preferences and your interests. Zanzibar is well connected with Tanzania's mainland and with its national parks, so you may either have a short safari during your vacation to Zanzibar, or get to Zanzibar after your safari, maybe to have a rest. Obviously a real safari that will give you a good overview of the various ecosystems and of all the wildlife, would require a minimum stay of 7-10 days, while there are many local agencies that offer tours even in a day from Zanzibar (via private flights on small aircraft) including a brief visit to the Serengeti or to other parks in Tanzania: this is obviously not a "safari in Africa" but only a brief pause, perhaps to break the daily monotony of a long vacation at the beach. Anyway, if you are traveling to Zanzibar, the companies listed below offer airport transfers from Zanzibar airport to any location on the island, including resorts, guest-houses and private addresses. Using airport transfers is highly recommended to travel in full peace of mid, with everything already set and confirmed before leaving home country. The Arusha National Park is located in northern Tanzania near the homonymous town and near the airport of Kilimanjaro. A safari in Arusha offers the opportunity to observe giraffes, zebras, buffalo and other animals of the savannah, as well as some primates like the colobus and vervet monkeys. Lake Manyara is home to elephants, zebras, giraffes and many baboons that can be easily observed with a short safari on the hills present between the forest and the banks of the lake. Worth noting is the abundance of baboons and vervet monkeys organized in large families of dozens of individuals. The protected area of Ngorongoro is a pretty popular destination for a safari day trip, thanks to almost guaranteed sightings of many of the species typical of the African savannah. Ngorongoro is an interesting destination for the beauty of the landscape, dominated by the largest volcanic caldera in the world. The trip to Tanzania continues through the dusty tracks crossing the savannah and linking the central Serengeti with our previous destination. However, thanks to the presence of many animals, what should be a simple transfer, it becomes actually a real safari which might offer interesting encounters. A full day safari in central Serengeti, near Seronera, brings us in close contact with cats of the savannah, such as leopards, cheetahs and lions, not to mention the abundance of other animals including large heard of hippos and elephants. Also interesting is the landscape, where the flat savannah is often interrupted by the kopje, picturesque rock formations. From Seronera we reach Lobo, an area of ​​northern Serengeti still not invaded by mass tourism, where we meet herds of wildebeest and zebras, as well as a family of lions that is consuming the fruits of the hunt that took place just a few hours before. Of course, there elephants and many species of antelope, including the lovely dik-dik. The wildebeest migration, with their ford across the Mara River, is probably one of the most incredible and fascinating spectacle that the nature can offer, so we dedicate a full day safari in search of a wildebeest herd determined to reach the opposite side of the river and we were lucky enough to see this fantastic event. Lake Natron is surrounded by an unusual landscape dominated by the bizarre and violent geology of the Rift Valley, where various types of volcanoes erupt lava which give rise to different kinds of rocks. We reach the breeding site of the pink flamingos, but all we find is just a magnificent landscape consisting of salt and soda, without any trace of the flamingos' nests. The Tarangire National Park in northern Tanzania is especially known, accordingly to the time of year, for the presence of huge elephant families. Of course, there are also many of the other animals typical of Tanzania and the park is also known for hosting many baobab trees, often exceeding hundreds of years in age. Safari in the national parks of Uganda, culminating with a trek in the rainforest searching the rare mountain gorilla. A long route that develops between the Okavango Delta and various national parks in Botswana, up to Victoria Falls in Zimbabwe.